This week's Family Home Evening lesson was based on the Gospel Principles manual, Chapter 21: The Gift of the Holy Ghost. We were fortunate to have my brother and his girlfriend join us for FHE this week. June loved having her Uncle Danny and Linzy participate in the lesson and activity. And, she got so many extra cuddles. Lesson: The gift of the Holy Ghost is the privilege—given to people who have placed their faith in Jesus Christ, been baptized, and been confirmed as members of the Church—to receive continual guidance and inspiration from the Holy Ghost. A person may be temporarily guided by the Holy Ghost without receiving the gift of the Holy Ghost (D&C 130:23). However, this guidance will not be continuous unless the person is baptized and receives the laying on of hands for the gift of the Holy Ghost. 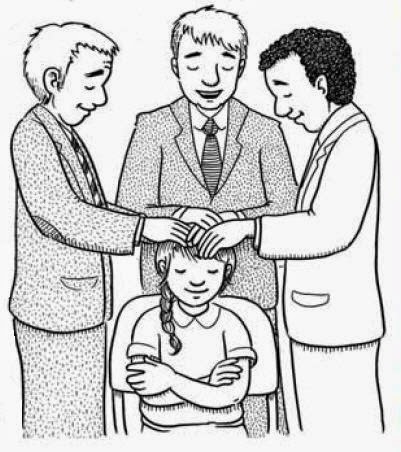 After people are baptized, they are confirmed members of the Church and given the gift of the Holy Ghost by the laying on of hands. The Lord said, “Whoso having faith you shall confirm in my church, by the laying on of the hands, and I will bestow the gift of the Holy Ghost upon them” (D&C 33:15). Each person must “receive the Holy Ghost.” This means that the Holy Ghost will come to us only when we are faithful and desire help from this heavenly messenger. To be worthy to have the help of the Holy Ghost, we must seek earnestly to obey the commandments of God. We must keep our thoughts and actions pure. The Holy Ghost communicates to us in many different ways. We can experience any of these. He can manifest as a warm feeling, a tingly feeling, a good feeling, sureness, knowledge to our minds, a still small voice, an audible voice. We often refer to guidance from the Holy Ghost as a prompting. For myself, I have a sure knowledge of things placed into my mind. The gift of the Holy Ghost is one of God’s greatest gifts to us. Through the Holy Ghost we may know that God lives, that Jesus is the Christ, and that His Church has been restored to the earth. We may have the promptings of the Holy Ghost to show us all the things we should do (2 Nephi 32:5). The Holy Ghost sanctifies us to prepare us for God’s presence. This great gift from our Heavenly Father can also bring peace to our hearts and an understanding of the things of God (1 Corinthians 2:9–12). 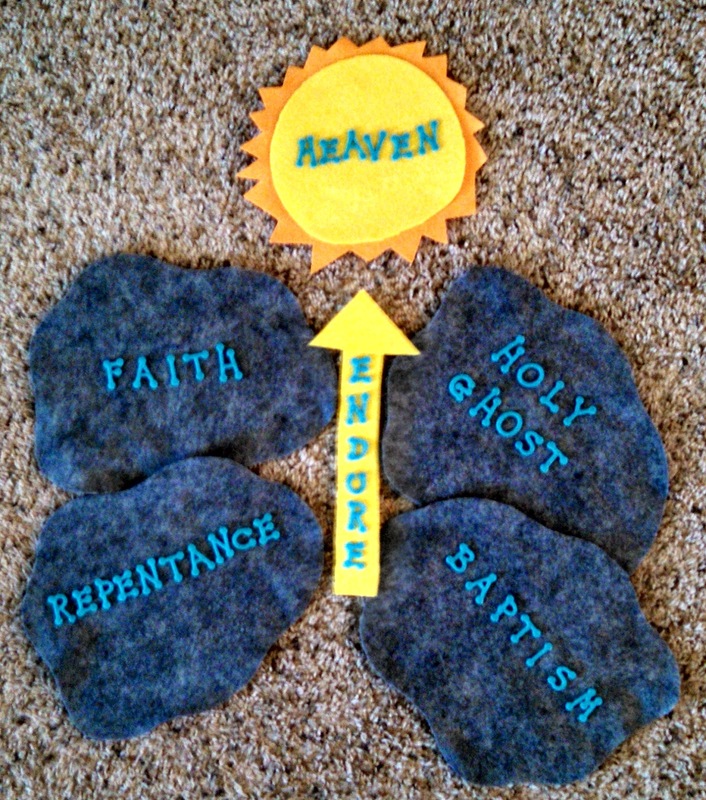 Activity: I prepared 4 felt stepping stones (you can use paper, or foam, or real stones if you'd like) where I wrote "faith", "repentance", "baptism", and "Holy Ghost" on each of them. I then made a straight felt arrow on which I wrote "endure". Finally, I made a felt sun which had "heaven" on it. I placed a blanket down on one end of a room and placed a sign reading "earth" on it. Then I taped the sun onto the adjacent wall. 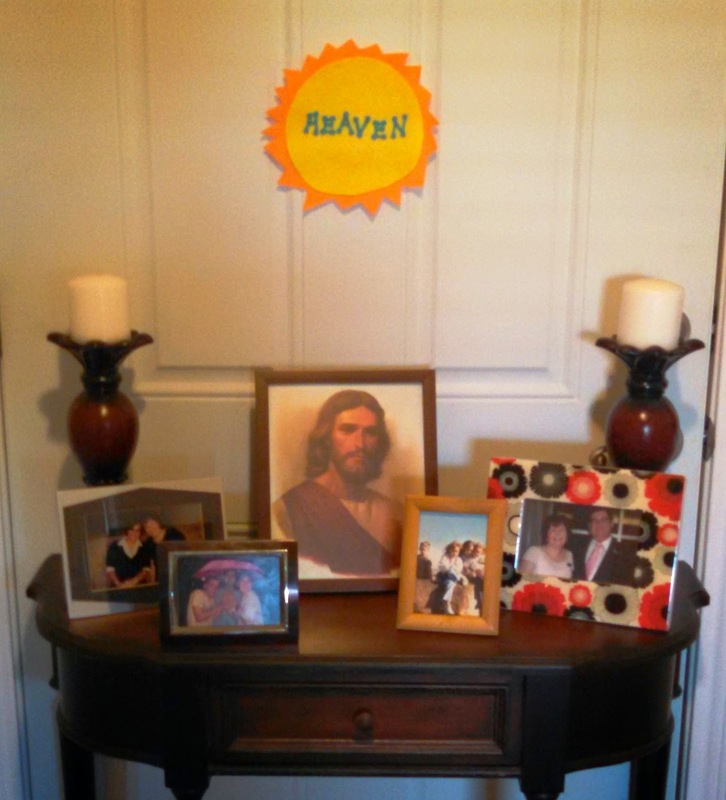 Underneath it, I set up pictures of family and Christ. I made sure the heaven side of the room was well lit with the earth side being darker. I had June, Danny, and Linzy all stand on "earth", and I asked them if they wanted to go to heaven. They all said yes. I told them that they were currently on earth, but they could try to jump to heaven. However, all the carpet was hot lava and if they touched it they had to go back. So, they all tried to jump to heaven, but of course it was too far away. How can they make it to heaven? They need a stepping stone. I laid down the faith stone and told them how having faith in Jesus Christ can help them. So they all jumped to the faith stone. But, could they jump to heaven with just faith alone? Nope, still too far away. Next stone was repentance. I explained how consistently repenting would help them get to heaven. They all jumped to the repentance stone. But still, they couldn't make it to heaven with faith and repentance alone. June then shouted, "We need another stepping stone!" So, I placed down the baptism stone. I explained how baptism is the first saving ordinance we need to be able to enter heaven and can help us on our way to heaven. But, were faith, repentance, and baptism enough? Not quite. June again excitedly shouted, "We need another stepping stone!" I then set down the last one, the Holy Ghost stone. I explained how receiving the gift of the Holy Ghost is the second saving ordinance to help us get to heaven because He will always be our guide--if we remain worthy--to help us get there. So they all jumped to the Holy Ghost stone. Now, they could make it to the tile floor, but from there were three paths. How to know which path to choose? I placed down the endure arrow and had it point to heaven. I told them this was the straight and narrow path that leads to heaven, and they must endure to the end in order to make it there. Along the path I placed pictures of the temple, the scriptures, a missionary tag, a hymn book, family members, and General Conference talks. I asked June what could help her endure to the end? 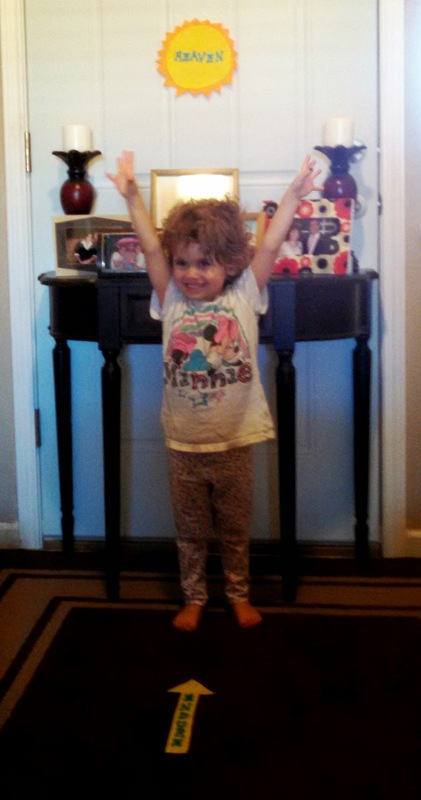 Each time I asked her, I pointed to the item in front of her and she would loudly shout the answer "Temple!" "Scriptures!" "Prophet!" "Commandments!" "Church!" "Family!" "Missionaries!" (or sharing our testimony). Then she made it to heaven! June was so happy that she 'won' the game. Even better, she said "I'm so happy I made it to heaven! Come on Uncle Danny and my Linzy! It's fun here!" I couldn't have put it better myself. This activity went over incredibly well. June really had a blast with it; I think it's one of her most favorite FHE games. Danny and Linzy enjoyed it too. I actually got the idea from my brother Bobby who used this as a way to teach the missionary lesson on gospel principles and ordinances while on his mission to Ogden, Utah. I modified it a tad and added my own flair, but what a great idea. I'm glad I took the time to make felt props instead of just use paper since it kept people from slipping and they are more durable. I may even do this as an outside game next time and use real stones, having them hop across the yard. So many options. After FHE, Danny and I decided to collaborate on our family history research into our maternal grandmother's ancestry line. I seem to have hit a brick wall in my research and Danny had great suggestions concerning searching tactics that proved highly effective. Turns out in Norway at the time we were looking, last names weren't passed down through the father's line. Instead, the children would inherit their last names from their father's first name. Specifically, I was looking for the parents of Petrine Berentson. Her father's name was Berent (or a variation thereof). Hence, that made her last name Berentson, which means child of Berent. We found some names we feel strongly are the people we're looking for; we just need to find more documents confirming our promptings. This was a great teaching opportunity for June as well, who was sitting on the bed with us and our laptops. I told her that we need our family to get to heaven, and we can help them get to heaven too by sharing our testimony and by doing family history research and discovering those very ancestors. I'm glad my brother came to visit, especially since I never would've thought to search in this manner. I love how you laid out this activity, SO FUN! I'm excited to try it out in our next Family Home Evening, thank you Rachel! Thanks. I'm glad that my FHE's can help others. I put a lot of work into them, so I love hearing that they are being used. Let me know how it goes. I am so excited to use this activity tomorrow! My oldest is being baptized next month so I have been trying to do as many lessons on baptism and the Holy Ghost that I can find. Thank you for sharing! Thanks! My daughter still loves to get out this activity and play it on her own. Thanks you! That is a great idea--to use this in church. I think I will do just that as well. im gonna try this with my ctr 5 class. THX!